Khao tom or boiled rice is excellent in combination with a a set of other dishes. It normally comes in small bowls with a watery rice. I have a couple of favourites when it comes to khao tom restaurants in Bangkok, one in the Thong Lor area and this one, Khao Tom Jay Suay, in Chinatown. 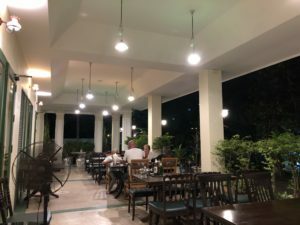 It’s slightly out of the ordinary tourist menu, and I have never seen a westerner here, but this webpage is about getting peoples attention to the good food and the good vendors there is in Bangkok and to forget about all the dull and bland food you get in most places. Pleasant people, a lot of traffic and some lovely food. 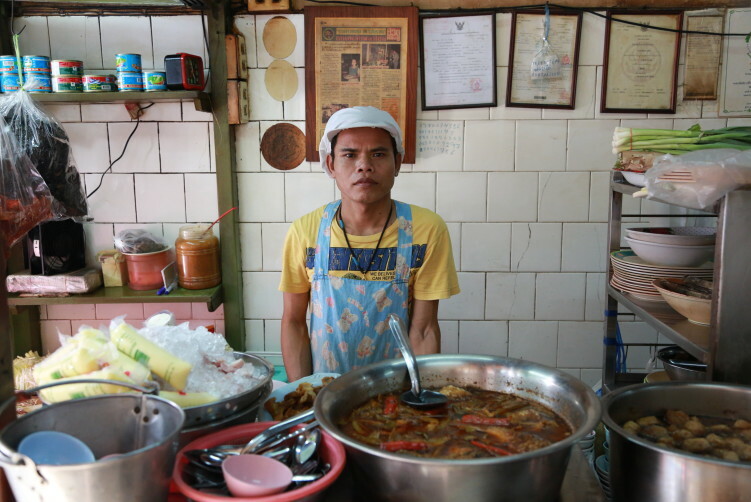 You can’t ask for more, at least lunch time when strolling around town on the search for Bangkok’s soul and heart. For locals the restaurant is known as Khao Tom Roy Pee, where roy is 100, in other words the 100 year old boiled rice. I don’t think the resto is that old but it has for sure been in the business for some decades, most likely more than 50-60 years. They are situated in an ancient shophouse in Chinatown, close to where the new MRT station is being built in Charoen Krung Road. Khao tom is normally served with condiments, and it most likely derives from the Teochew (Chinese) kitchen. Many restos serves it with the condiments you order, but personally I like to have a bowl and several plates a side and to mix. It’s a very common breakfast dish in Bangkok, but they also have plenty of other dishes on the menu, including traditional dishes such as smoked duck, jap chai (a kind of Chinese vegetable stew), and clams stir-fried in their own home made nam prik pao. The name of the dish would be (hog lie pad prik pao, where nam prik pao is the Chili paste. Absolutely one of the more sophisticated weapons of Thai cuisine. You can buy their nam prik pao to bring you if you want. The food is tasteful and healthy with a lot of focus on fish and vegetables – and no, it’s not as boring as you might think. When there you should definetively try their smoked duck and their minced pork with salted Chinese olives (moo phat nam lip). 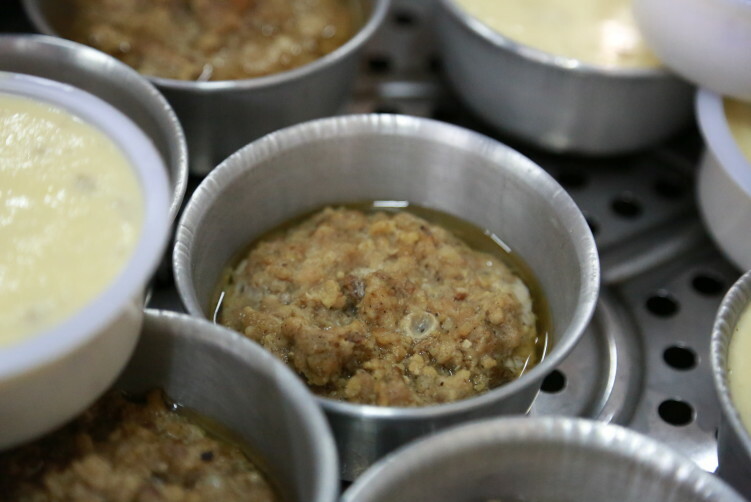 They also have stir-fried stink beans and a variation of soups, including one with squid and mushrooms. As soon as you have crossed Charoen Krung road, coming from Yaowarat, you should look to your right. 3 to 4 houses down the road on the right side is where you can see table out front covered with vegetables and ingredients. Behind the table you see their work station with a meat and fish inside, including some pre-prepared dishes. The stir-fry dishes is made in the back of the room. On my last visit I also ordered a dish with pork and mackerel in oil that had been steamed. It came in ready made portions, was salted and had a strong and salty flavor. Very good and very different. As mentioned, it’s not were you go to celebrate your 50’s anniversary, but somewhere you go to eat good, tasty and home made food. Only the traffic will be next to you, but what does it matter. The food is full-flavoured and you’re most likely not on your way to the ballroom. In my world, tastes rules. There are indoor and outside tables. If you’re still hungry and in for some fatty stuff, I just have to recommend Nai Mong Hoi Tod, one of the absolute best places for an oyster omelette, 50 meters down the road. It’s fatty, it’s flavorful, and if you haven’t tasted it before, something you will replace your burger or Pad Thai with. order now Food: Rice soup to combine with different dishes, both fish based and meat based. How to get there: From the intersection of Yaowarat Road and Plaeng Nam road (also written Plang Nam), head up Plaeng Nam, cross Charoen Krung, and look for the small shop to your right. It’s about 50 meters closer to Charoen Krung road than Nay Mong Hoi Tod. If walking down Charoen Krung, turn right after Kwong Siew Hospital (sometimes written Kwongsiew) and you find it to your right a few meters down Phlap Phla Chai road. Wat Mangkon Kamalawat, commonly known as Wat Leng Noei Yi is the largest and most important Chinese Buddhist temple in Bangkok. It host celebrations of a number of important events, including Chinese New Year, and the annual Chinese vegetarian festival. 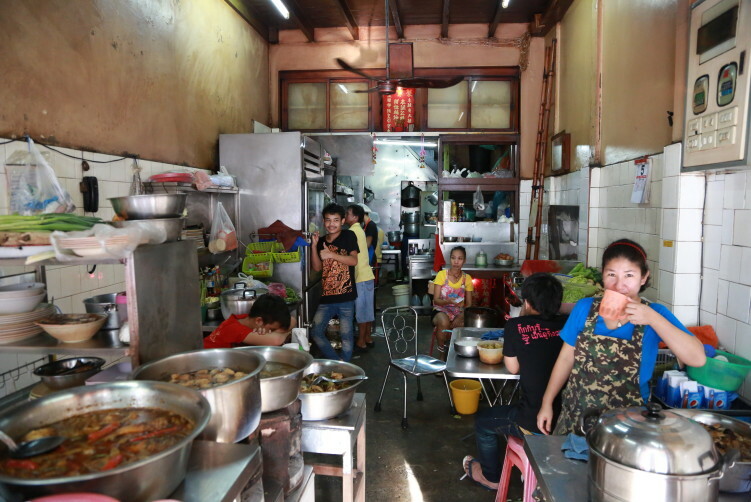 It is located in Chinatown, in a courtyard off Charoen Krung Road, accessed by an alleyway. It was founded as a Mahayana Buddhist temple either in 1871 or 1872 (sources differ). The current name, Wat Mangkon Kamalawat, means “Dragon Lotus Temple” and the name was given by King Chulalongkorn (Rama V). The temple is built in a classic Chinese architectural style, with typical sweeping tiled roofs decorated with animal and floral motifs, including the ubiquitous Chinese dragons. The ubosot (ordination hall) houses the temple’s main, gold colored, Buddha image in the Chinese style, and is fronted by an altar at which religious rites are performed. The main entrance to the viharn (sermon hall) is flanked by large statues of the four guardians of the world, the Chatulokkaban, clothed in warrior costumes, two on each side. Around the temple there are shrines dedicated to a variety of Buddhist, Taoist and Confucian deities and religious figures, all important in local Chinese beliefs. At the rear of the temple stand three pavilions, one dedicated to the Chinese goddess (or bodhisattva) of compassion, Guan Yin, one to the temple’s founder, Phra Archan Chin Wang Samathiwat, and one to the saint Lak Chao. Near the rear is also to be found a gallery containing cases of gilded Buddha images in the double Abhaya Mudra position. 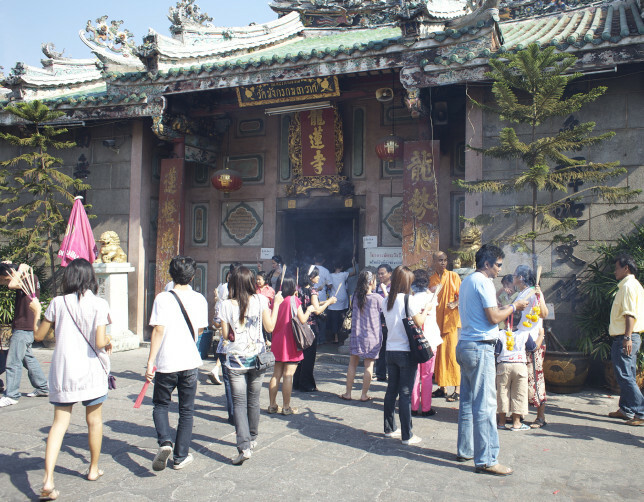 The courtyard in front of the main temple buildings is home to several other shrines, including a furnace for the ritual burning of paper money and other offerings to the devotees’ ancestors.